Starting in 1938, the Ministry of Communications and Transportation established Pilot Training Schools throughout Japan to serve as training facilities for pilots who would work in the Ministry primarily to carry mail by plane. During the Pacific War, which started in December 1941, the Navy and Army utilized these Pilot Training Schools as sources for trained pilots. Men who trained at Nagasaki Pilot Training School and who survived the war formed an association after the war and erected a monument in April 1995 at the former site of the school, where the Isahaya City Softball Field is now located. This training school opened its national civilian pilot training facilities in April 1942. Until the end of the war, over 120 instructors gave rigorous Navy-style training to 441 students in the regular course of study who entered at 12 or 13 years of age and 162 pilot trainees who entered at 17 or 18 years of age. These students resided at Isahaya during their training. Among those who graduated at 18 or 19 years of age, 102 men devoted themselves as Navy airmen in World War II, and over 50 died in battle as members of torpedo squadrons, special attack squadrons , and other units. This monument has been erected for the repose of the souls of those men who died in battle and as a remembrance to the youths of survivors. The Navy took over Nagasaki Pilot Training School in March 1944 and established the Isahaya Air Group. 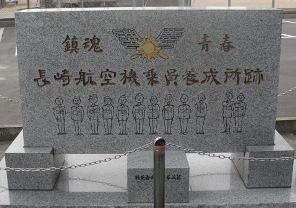 The Isahaya Naval Air Group Monument, erected in 1973, stands a short ways down the road from the Nagasaki Pilot Training School Monument. 1. The Japanese word for special attack squadrons is tokkotai, which carried out suicide attacks against Allied ships near the end of WWII. The Japanese Navy's special attack squadrons that carried out aerial suicide attacks were called Kamikaze (or by the formal name of Shinpu).